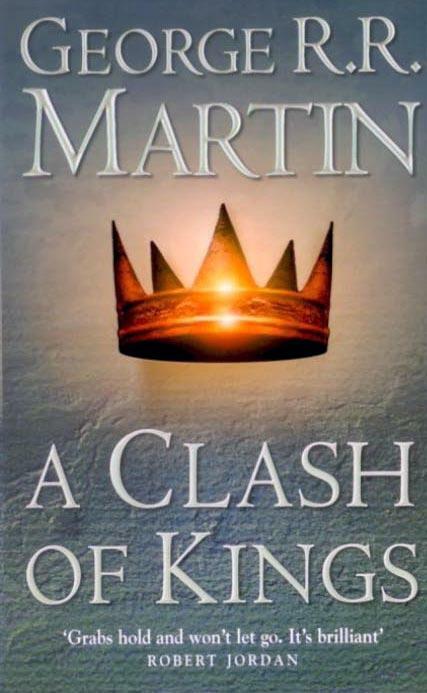 SYNOPSIS - The Seven Kingdoms are divided by revolt and blood feud as winter approaches like an angry beast. In the northern wastes a horde of hungry, savage people stepped in the dark magic of the wilderness is poised to invade the Kingdom and the North where Robb Stark wears his new-forged crown. And Robb's defenses are ranged against the South, the land of the cunning and the cruel Lannisters, who have his young sisters in their power. Throughout Westeros, the war for the Iron Throne rages more fiercely than ever, but if the wall is breached, no king will live to claim it. EXCERPT - The sky was as black as the walls of Harrenhal behind them, and the rain fell soft and steady, muffling the sound of their horses' hooves and running down their faces. They rode North, away from the lake, following a rutted farm road across the torn fields and into the woods and streams. Arya took the lead, kicking her stolen horse to a brisk heedless trot until the woods closed in on her. Hot Pie and Gendry followed as best as they could. Wolves howled off in the distance, and she could hear Hot Pie's heavy breathing. No one spoke. From time to time Arya glanced over her shoulder, to make sure the two boys had not fallen too far behind, and to see if they were being pursued. 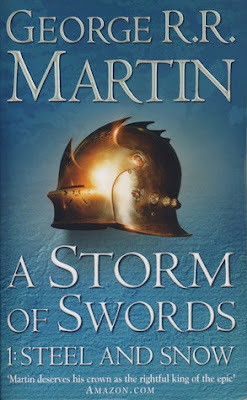 FL Speaks - After a gap of 2 months, i am back to this masterpiece of George R.R Martin. I needed that break to clear my head and start the story afresh. Its a staggering tale, with characters so many and vivid that it would do well to sit down with the book with a clear mind. The war rages on in the Seven Kingdoms. Loyalties are brought and discarded by the weight of coins. Catelyn Stark releases the main villain so that her daughters are returned safe. The Kingslayer, Jaime Lannister is free but the journey to Kings Landing is treacherous. Beyond the Wall in the North, Jon lives with Mance Rider, the ruler of the Free Folk and acts as a spy for the Nights Watch. Tyrion by far is the best character yet again in this book. The absolute hilarious time was when he was forced to marry Sansa Stark. The sad thing is now when i get to read about him, Sansa inadvertently will tag along. That was a cunning move by the Lannisters as they plan to secure Winterfell through that marriage if Robb dies without a heir. Arya's story was dissapointing of all. I mean come on! Its almost predictable now. She's on the run, gets caught. Escapes and gets caught again. Though this time, her captors are much better. Bran is on his way to the land beyond the wall to learn the mysteries of his dream state. Meanwhile Stannis Baratheon's army is broken and the red priestess warns them of a far greater danger approaching. As Stannis focuses on his war against Joffrey and the Lannisters, Daenerys is on the way to Westeros with her army and her three dragons. Jaime Lannister is captured on his way to freedom and his sword hand is cut. I absolutely loved that. Call me heartless, but that monster deserves more than a crippled hand. Thankfully, we have very less of that idiot Joffrey in the book. Not that great book compared to the first two, but the last 100 pages or so are one of the very best. The Others or the Undead make their way to the wall and a surprise by Jon towards the end makes me itch to read the second part of Book Three.